To continue celebrating the Seabee’s 73rd Birthday this week, it seems only logical to explore the history behind the Naval Mobile Construction Battalion’s most famous and recognizable insignia, The Fighting Seabee. You will see it everywhere from the official work uniform, stamped onto the side of military vehicles and construction equipment, to memorabilia; t-shirts, souvenirs, and we cannot forget the female bee, Phoebe. The Seabee may be the official insignia for the construction battalion, but it is also the symbol of pride and honor to all men who serve. 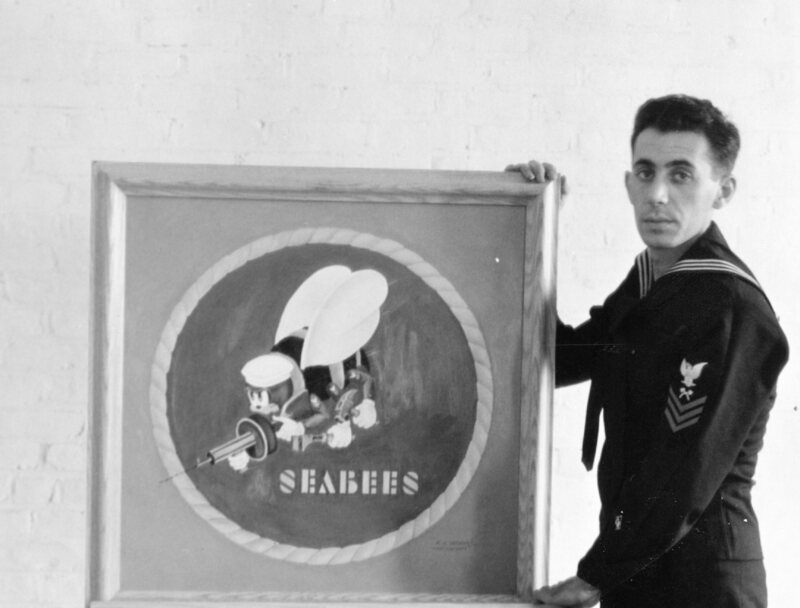 The Seabee insignia was created by Frank J. Iafrate in 1942, who at the time was a file clerk at the Naval Air Station in Quonset Point, RI. He had gained the reputation of drawing sketches and caricatures of the men who came into his office for reference material. One day a Navy Lieutenant came in and explained to Frank he was to lead a newly established group of recruits who were not only trained in construction work by civilians, but would also be receiving military training; they would be supporting the Marines. This special group was referred to as the “Construction Battalion.” These new units replaced civilian workers the Navy had recently lost on Guam and Wake Island. These men would be an offensive group but could defend themselves if necessary. Known for his cartooning, the lieutenant asked Frank if he could produce a “Disney-type” insignia which would identify and represent this new battalion. Excited by the challenge, Frank put his mind to work immediately. His first idea was originally a beaver, the builder. But after some research, it was found that while beavers are good workers, they do not have the courage to stand up to a fight. So the beaver idea was abandoned. His next idea was of the “busy bee;” the hard worker who won’t bother you, unless you bother him. At which time he is capable of stinging you to protect himself and his property. This fit perfectly with the construction battalion. Now what would his new creation and this group be called? Believing the “Men of the Construction Battalion” was a little inelegant; he already had the “bee” and the men who worked at sea. Ergo a phonetic depicting the initials “C” and “B” became “Seabees.” It was short, and easy to remember. The Fighting Seabee had been born. After Frank showed it to the lieutenant, then the officer in charge of construction, the new insignia was sent to Washington, D.C. to be shown to Rear Adm. Ben Moreell (CEC) who was chief of yards and docks, and the creator of the construction battalion. 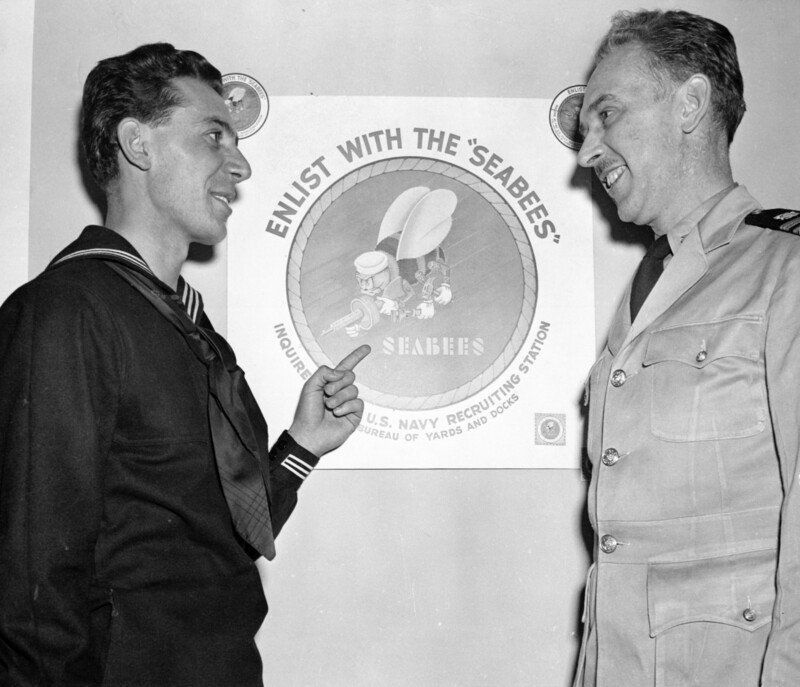 Moreell was impressed; believing the insignia and the designation of the “Seabees” would add much to the esprit de corps of the construction battalion. The Seabee had incredible recruiting appeal and was used for the nationwide campaign. Eventually the insignia became the official symbol for all the battalions. Just as it was important in the establishment of the construction battalion, the Fighting Seabee is still as notable today as the day it was created. The official insignia has remained in use and unchanged since its inception in 1942. Although Seabees themselves love this “Fighting Bee” so much, many battalions have created their own modified version of the bee to represent their deployments. Every generation of CB’s have worn the Seabee on their uniform with pride. 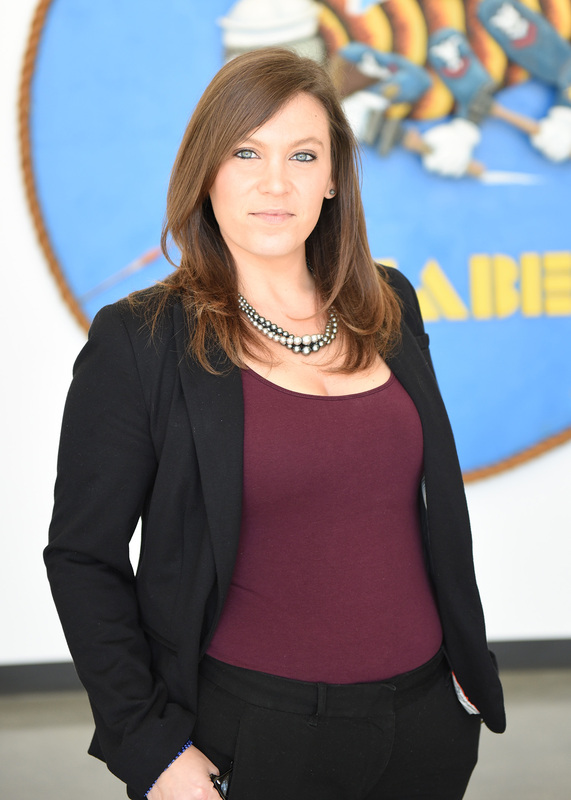 Along with their motto, “We Build, We Fight,” the symbol of the Fighting Seabee encompasses the essence of what it means to serve ones country and be humanitarians around the world for the greater good. A collection of the various Seabee mascots and logos can be found in our World War II exhibit that presents the Seabee training experience. Stop by the museum to check it out. This entry was posted in Curator's Corner, Seabee History and tagged CEC, Civil Engineer Corps, military history, Naval History and Heritage Command, Navy Heritage, Navy History, Seabee Birthday, Seabee history, US Navy Seabee Museum. That is a great story. I knew parts of it, bu you brought it all together. Thank you so much. Willard cannon mcb4 1965-68. Very good info, factual and well presented. Thank you, A job well done. A short story..Back on 23 February, 1943 my uncle was fresh out of basic training. Visiting his sister, my mother, she asked “Where are they sending you?” He replied “I don’t know but they put me in the Seabees”. I was five then and didn’t have the slightest idea what I listing to. But, I remember thinking “When I grow up I’m joining the Navy and I’m going to be a Seabee too. I had never consciously did anything to achieve that end. Fifteen and a half years later, August 1958 I walked into a Naval Recruiting Office and said “I want to join the Seabees”. The recruiter jokingly asked “Why did they show John Wayne and The Fighting Seabees on TV last night?” I answered “No, I decided that when I was five!” I couldn’t believe what came out of my mouth. I have served six years form August 1958 to August 1964 attaining the rank of Builder 2nd class. In February 1943 the Seabees, an unknown part of the Navy, was only nine months old. Here we are today on the threshold of our Seventy Fifth anniversary. The story as to how the Seabee insignia was born hangs on my wall along with excerpts from my service record. I still wear, with great pride, jackets with many patches and embroidery letting whoever sees me know….I am a Seabee!